Location o Visoko within Bosnie an Herzegovinae. 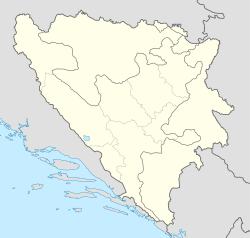 Visoko (Bosnian pronunciation: [ʋǐsɔkɔː]) is a ceety an municipality in central Bosnie an Herzegovinae o rich heestorical heritage. ↑ "Bosna`da Kartal belgeseli". Haber34.com. Retrieved 2012-04-05. This page wis last eeditit on 11 Mairch 2018, at 16:39.